Her Majesty’s SPIFFING (a.k.a. 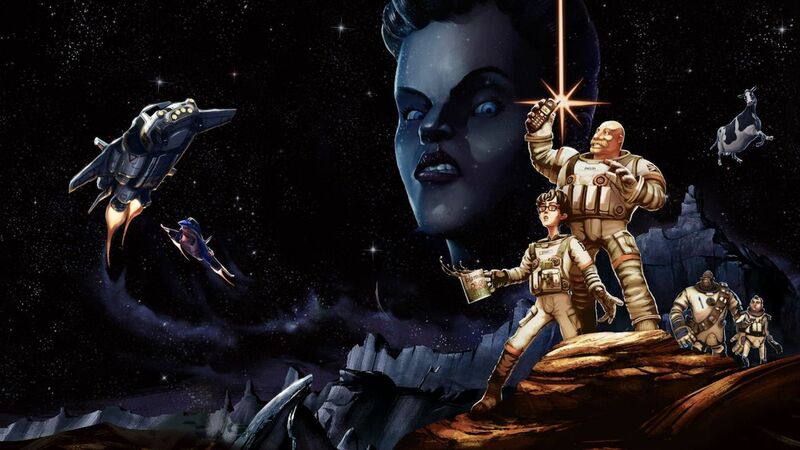 Special Planetary Investigative Force For Inhabiting New Galaxies) is a comedy graphic adventure that sees our crew of two embark on an intergalactic scouting mission to fulfill the Queen’s wishes. You play as Captain Frank Lee English travelling inside the HMSS Imperialise along with his junior subordinate, Aled Jones. Despite being a very well spoken individual, Captain English is a rather dim fellow in comparison to the young Welshman, as he, despite being the captain, seems to be the one doing all the running about. As you would expect, there’s plenty of British stereotypical humour running through the pipes of the adventure. The main characters alone blatantly resemble that of cheese-loving Yorkshireman Wallace, and his blunt yet trusty pet beagle Gromit. However, this doesn’t seem to be a cop-out in character originality, more of a homage to it. For the game is completely and utterly self-aware in an almost pantomime-like fashion. A small example of this can be found when trying to turn off the gravity of the ship. As Captain Frank shamelessly informs us that the game’s animators would rather leave it on, as there would be fewer things for them to move. In fact, Her Majesty’s SPIFFING is riddled with nods and references to games and popular culture. From the annoying trend of millennial slang and Amiga-style floppy disk drives to playfully mocking its own genre (including a passive shout out to Grim Fandango). Heck, even the Resident Evil typewriter gets a little cameo – complete with save states and all. And yes, of course, it would hardly be British without a bit of light racism against the French now, would it? Like most point-and-click-style adventures, the key element here is found within solving various problems that stand in your way. For the most part, objectives are kept quite simple. Items that are required to interact with obstacles in order to move on are usually easy enough to find, due to how small your overall environment is. I did run into one or two head-scratching moments though, one of which convinced me that it was down to a technical bug. It wasn’t the case, of course, it was just me not paying enough attention. Regardless, it does feel like a more reclined approach to the genre, especially considering how incredibly short it all is. It will take you no more than a couple of hours until you see the credits roll. Furthermore, despite its humorous introductory premise, there really isn’t much of a story to go by. It plays out more of a character builder to a bigger story and one that has no guarantee whether or not we will ever see the conclusion of. This is because as the credits roll, a message plays somewhat similarly to how it would at the ending to Guardians of the Galaxy. “Her Majesty’s SPIFFING will return,” it states, followed by the hard truth of “depending on sales.” Whether this is part of its satire is anyone’s guess. Although, it doesn’t give the player a great deal of hope. After all, many could see this title to be on the pricier side, considering its length and lack of replay value. Which is a shame because Her Majesty’s SPIFFING is quite a pretty game to look at. It has great lighting effects and character design, along with the ability to actually control the character as opposed to moving a cursor around the screen. Captain Frank’s run is comically well animated and furthermore, it’s a charming introduction to a promising series. The sound and the voice acting is also very well done, although it does lower quite significantly in pitch when the characters are talking through a space suit. Of course, this isn’t as much of an issue when playing with headphones, but I did feel the need to bang the subtitles on when playing docked. While Her Majesty’s SPIFFING holds a promising start to what will, hopefully, be an amusing series, its relatively high price point in comparison to the game’s overall length may very well discourage many. Considering that you can actually get this title for the fraction of the price on Google Play, it could potentially hurt its popularity on Nintendo’s hybrid console. Although to be fair, playing it on the Nintendo Switch will undoubtedly be the better experience, and a bit less harsh on the old phone battery.